Whenever I go to Dairy Queen (which is only, like, once or twice per year), I always treat myself to a Heath Blizzard. I’ve tried the other flavors, but they just don’t satisfy like Heath! There’s just something about the toffee and the chocolate that makes me swoon! If you’re a follower over at Amy’s Cooking Adventures, you might remember the Toffee Chocolate Chip Cookies, Toffee-Pretzel Peanut Butter Cookies, or the Chocolate Toffee cookies. Yep…I got it bad for toffee. Since I’ve exhausted the toffee cookies (for now), I decided it was time to stick that toffee into a cupcake! 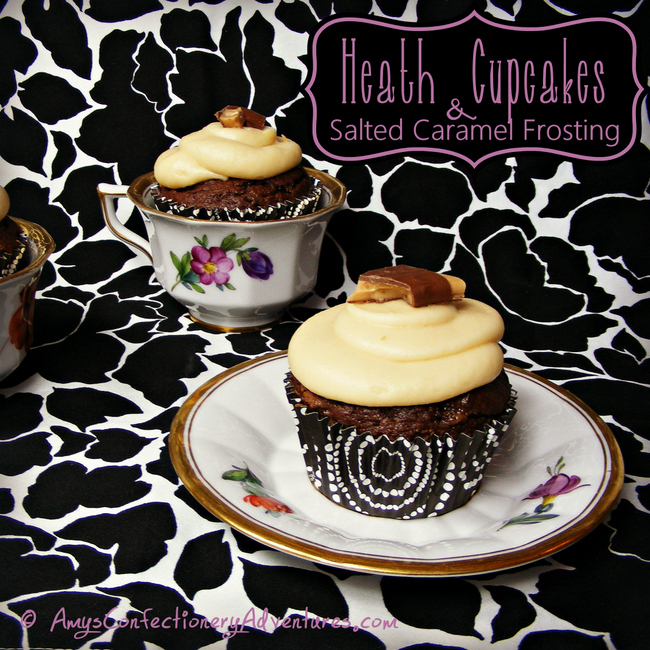 The cupcake is the rich chocolate cake recipe, only with toffee bits added in, the topped off with an amazing salted caramel frosting and more Heath. The cupcakes are super delicious and very indulgent! I’d plan to take these somewhere where there are lots of people to eat them up, because the leftovers are waaaay tempting! Add the espresso mixture, along with all of the remaining ingredients into the bowl of a stand mixer. Beat for 2 minutes on medium speed until smooth and well combined. Stir in the heath bits. The mixture will be thick and pudding-like. Cool the cupcakes completely before icing. To make the frosting, place the cream cheese and butter into the bowl of a stand mixer. Beat on medium speed until smooth and combined. Stir in the vanilla, caramel, and salt. Turn the speed to low. Mix in 3 ½ cups of powdered sugar, beating until smooth and combined. Slowly add the remaining sugar until the desired consistency is achieved. Pipe the frosting onto cupcakes and top with a piece of heath bar.